Looking for an unusual story that illustrates being your true self, loving life and living your purpose ala, Lady Gaga’s “Born This Way?” Pioneering musician, singer, composer and educator Barbara Borden didn’t just dance to her drummer – she literally became the drummer. Starting her career as a little 10 year-old girl, growing up to be one of the preeminent female jazz drummers in the 1950’s through 80’s – Barbara continues to re-invent herself to this day – 55 years later. In the 90’s she composed several world music albums including her solo recording, “Beauty in the Beat” and launched her solo autobiographical percussion play, “She Dares to Drum”. 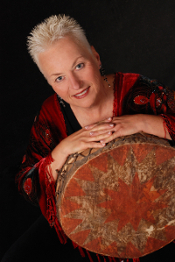 From 1994 to the present, Barbara has traveled the world, visiting Africa, Asia, Europe and North America as a drumming Ambassador of Peace. Most recently, Barbara sings, drums and leads her rock and roll band, Hearts on Fire. Take a look at photos, bios, press releases, reviews and videos of this vibrant polyrhythmic percussionist. For a more in depth chronicle of her life, check out KEEPER OF THE BEAT, a biographical documentary-in-progress by Emmy Award-winning filmmaker, David L. Brown.